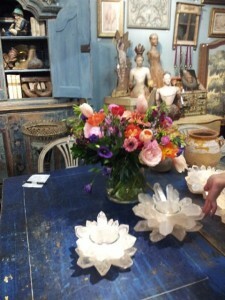 Flowers from Amsterdam @ Battersea Fair.Jan 2013. Flowers especially brought over from AMSTERDAM, shown here with lotus shaped Brazilian rock crystal candle holders. Bie Baert & Odette Weloaars stand @ Battersea Antiques Fair. London Jan.2013.